The increasing demand for services convinced us to open the garage just for that. Apart from simply buying best accessories and fluids on the market, you can have your oil and car battery replaced. The store is located by the road to Świętochłowice, approx. 500 meters from railroad overpass. 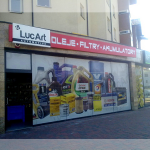 It is situated next to a car wash.
LucArt Dąbrowa Górnicza is the fourth store within our chain. The well-respected brand has quickly been noticed which made this store develop in a very rapid way. It’s location allowed us to reach even more customers. We are proud to help clients with getting the best products available on the market. The store is located by the main road to Gołonóg district, in the OBLIGO building. LucArt Gliwice is a real milestone for our company – it is the first store licensed under a franchising agreement in our, now well-developed, chain. 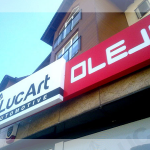 Thanks to LucArt’s full support, this unit became profitable almost from the start. The professional customer service helped us witness the always-increasing demand. The store is located in AVA Hotel building, near Shell petrol station and Bodzio furniture store. LucArt Głogów is yet another confirmation of LucArt constant growth. The customers from Głogów and surrounding cities can now simply hop in and experience the highest quality of service. What’s more, they do not have to wait for the products to be shipped anymore. The store is located opposite the Dworcowa Gallery. LucArt Katowice is another licensed store in our constantly developing chain. The success of its predecessors made the brand even more interesting for new investors. Katowice, being the „heart” of Silesia, is the perfect place for a great number of customers to buy the best products on the market at the lowest possible price. The store is located in the Trzy Stawy centre, about 100 metres from McDonald’s. LucArt Mysłowice had its opening in 2007 and was the first store in what is now a real chain. It began with a small office and a warehouse. Constant development made it possible to hire more staff and rent more space. Now LucArt Mysłowice houses 3 offices, a store and two warehouses that employ more than 10 people. The store is located by the road to Katowice, behind ALDI store. LucArt Olsztyn marked another big step in our development – never before have we licensed a store so far from the head office. Such a move helped us reach even more customers willing to purchase the best products at the best price available. The store is located at Mazurskie Housing Estate by the road to Szczytno, behind a bus stop, next to a pharmacy (accessed from Stefczyka Street). LucArt Opolu is the first, brave step outside of Silesia province. The move helped us expand our chain even further, reaching customers we could only ship to before. Now they are able to hop in and experience the best service available. The store is located near MultiFarm Pharmacy. LucArt Oświęcim helps us balance between two provinces, allowing even more customers to experience the best service and purchase the highest quality products at the lowest prices on the market. The store is located next to Hadex construction supply store. The demand for the engine oils, filters and car batteries increases rapidly, which is why we decided to open another store in Silesia. Now customers from Raciboórz and surrounding cities gained access to the best products without the need to travel long distance or wait for shipping. The store is located next to PROSAT. LucArt Rybnik is the fifth of our own stores. Due to the great deal of inquiries from our customers, we decided to expand the chain within Silesia region. Now the products can reach the clients even faster. The store is located behind Makro Cash and Carry, opposite VW Magro car showroom. LucArt Szczecin constitutes another step to the North. The unit will allow our customers from Szczecin and adjacent cities to pick up the goods themselves do they can get the best quality products even faster. Szeroka – from Taczaka St.
LucArt Tychy was opened to reach more customers within Silesia region – and it became a massive salespoint in our chain thanks to a great traffic development. It provides the best service for customers from Tychy as well as the surrounding cities. It also serves as a secondary shipping centre which allows us to deliver the products even faster after they are purchased. The store is located in 4 PORY ROKU housing estate, opposite Biedronka store.